An Oldowan core extracted from the site of Ain Boucherit. The discovery of 2.4 million year old stone and bone tools dating back to a site in Algeria suggests that our distant hominid parents have spread to the northern parts of the country. Africa much earlier than archaeologists supposed. The discovery adds credibility to the new suggestion that ancient hominines lived and evolved outside of a supposed Eden Garden in East Africa. This extraordinary discovery dates back to 2006, when Mohamed Sahnouni, lead author of the new study and archaeologist at the National Center for Research on Human Evolution in Spain, discovered fascinating artifacts on the site of Ain Boucherit, in northeastern Algeria, near the city of El-Eulma. These items were embedded in a sedimentary layer exposed by a deep ravine. Two years later, Sahnouni found another layer on the site, an even older layer. From 2009 to 2016, his team worked meticulously at Ain Boucherit, discovering a treasure trove of stone tools and remains of slaughtered animals. The team working at Ain Boucherit. Using multiple dating techniques, Sahnouni and his colleagues dated the two stratigraphic layers, named AB-Up and AB-Lw, respectively 1.9 million and 2.4 million years old. The objects of these two layers are now the oldest known artefacts in North Africa, the oldest being stone tools dating back 1.8 million years discovered in the late 1990s on a site neighbor called Ain Hanech. The tools found in the AB-Lw layer, aged 2.4 million years, are 600,000 years older than those of Ain Hanech and 200,000 years younger than the oldest tools found in East Africa (and worldwide, from elsewhere) – Oldowan tools from Gona, Ethiopia, were dated 2.6 million years ago. Scientists believed that early hominines had evolved in this region of Africa and spread north about a million years later. But this discovery now suggests a much earlier date of dispersion in the continent. To put these dates in perspective, our species, Homo sapiens, appeared 300,000 years ago. Thus, unknown hominins who built these tools raged around East and North Africa about 2.3 million years before modern man intervened. The new discoveries at Ain Boucherit, whose details were published today in Science, suggest that North Africa was not just a place where human ancestors lived and developed tools – it was a place where they evolved. Indeed, this new research feeds an emerging narrative, according to which human beings have evolved over the entire African continent, and not only in East Africa according to conventional thinking. In addition, this should be of greater archaeological interest in North Africa. "The Algerian evidence has changed [our] anterior view on East Africa [as] to be the cradle of humanity. In fact, all of Africa was the cradle of humanity. To date the layers, Sahnouni used three different techniques: magnetostratigraphy, electron spin resonance dating (ESR) and biochronological analysis of animal bones found mixed with tools. Eleanor Scerri, an Oxford University archaeologist who was not affiliated with the new study, said the researchers had done an excellent job with dating, saying it was "incredibly difficult" to date accurately ancient hominin sites. "The authors combined several dating methods to produce an estimate of age for early occupation of the [AB-Lw layer] about 2.4 million years ago, "Scerri told Gizmodo. "They did it by reconstructing first the sequence of geomagnetic inversions preserved at the locality, which are globally well dated. The researchers then found the chronological place of … occupancy layers within this sequence through a combination of electrospin resonance dating (ESR) minerals in sediments and fossil identification . [animals]. " Scerri said that these methods made the dates attractive, but implied uncertainties and assumptions. Jean-Jacques Hublin, a researcher at the Max Planck Institute of Evolutionary Anthropology – who also did not participate in the new study – was not enthusiastic about the dating techniques used by Sahnouni and his colleagues. "Extraordinary demands require extraordinary evidence and one can make reservations about the proposed age for the sites of Ain Boucherit and Ain Hanech," Hublin told Gizmodo. "Paleomagnetism is not a dating method. It helps to limit the dates obtained by other methods and is subject to various interpretations. " That's enough. These are extraordinary claims, so an independent effort to date these layers and artifacts would support the findings of the study. "If confirmed, the results suggest that hominins occupied North Africa almost a million years earlier than expected," said Scerri. "These dates would also make Oldowan in North Africa only slightly younger than in East Africa." Some Oldowan tools found on the site, including kernels and flakes. By Oldowan, Scerri refers to the oldest known stone tool industry in the world. 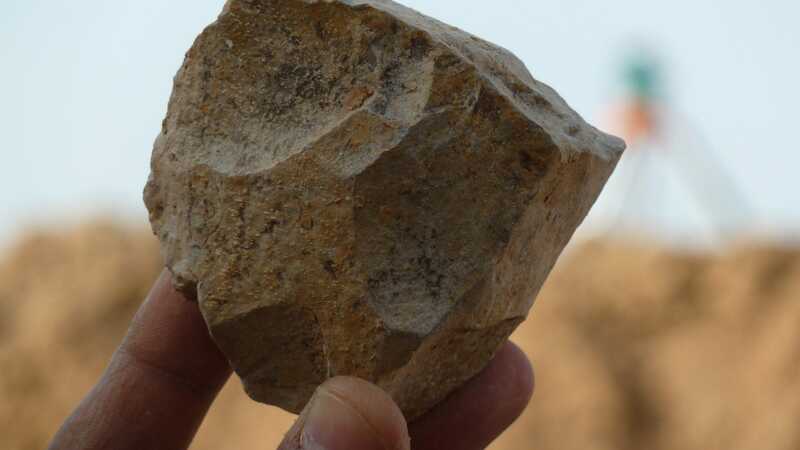 This technology has irreparably altered the evolutionary history of the hominins, paving the way for even more sophisticated stone tools, such as the Acheulean culture that followed. Remarkably, the stone tools found at Ain Boucherit were strikingly similar to the Oldowan tools of East Africa. Oldowan lithic materials have stone cores with flakes removed from the surface, producing sharp edges. In addition to these tools, researchers have uncovered heavily scaled ball-shaped rocks, the purpose of which is not entirely clear. "The archeology of Ain Boucherit, which looks like the technology of Gona Oldowan, shows that our ancestors ventured into every corner of Africa, not just in Africa. East, "said Sahnouni in a statement. "The Algerian evidence has changed [our] anterior view on East Africa [as] to be the cradle of humanity. In fact, all of Africa was the cradle of humanity. To explain the presence of Oldowan technology in North Africa, the researchers propose two scenarios: the technology was developed by hominins from East Africa about 2.6 million years ago, which were quickly spread and their new technology to the north, or hominins living in the North. Africa has invented Oldowan technology apart from other groups. Cut marks compatible with cutting. With regard to the animal bones discovered, archaeologists have found traces of mastodons, elephants, horses, rhinos, hippos, wild antelopes, pigs, hyenas and crocodiles. Obviously, these old hominins were not difficult to eat. Importantly, many of these animals are associated with open savannah environments and easily accessible permanent freshwater bodies. This probably describes the landscape inhabited by these Oldowan hominins at the time. The analysis of fossilized bones revealed characteristic signs of butchery, such as V-shaped gouges involved in evisceration and deflection, as well as nicks of impact suggesting spinal extraction. bone. Ain Boucherit is now the oldest site in North Africa, with tangible archaeological evidence of the use of meat in conjunction with the use of stone tools . "The effective use of Ain Boucherit knife-like sharp knife-like tools suggests that our ancestors were not mere scavengers," said Isabel Caceres, an archaeologist at Rovira i Virgili University in Spain. – author of the study, a statement. "Not clear yet [is] whether or not they hunted, but the evidence clearly showed that they were successfully competing with carnivores for meat and that they had first access to the carcasses of the animals. ;animals. " Unfortunately, no hominin bones have been found on the site. Researchers can only have a clear idea of ​​the species responsible for the tools. It could have been Homo Habilis, one of the first human species at the time, or even late Australopithecus, the hominin genre associated with Lucy's famous fossil. Scerri said that this article highlighted the importance of North Africa, as well as the Sahara, for archaeologists seeking to know more about human origins. The document, she said, also raises new questions about the earlier evolution of hominins, such as the origin and spread of Oldowan's technology. "The document can not answer these questions, but it alters the narrative by raising them, pointing out in fact that there might be alternatives to the dominant model of African origin," she said. declared to Gizmodo. "As the authors point out, the fossils of 3.3 million years Australopithecus bahrelghazali have already been found in the Saharan region of Chad. The findings reported by Sahnouni and his colleagues thus add to a growing body of evidence that North Africa and the Sahara may well lead to game-changing discoveries. " These results are remarkably consistent with Scerri's research. In an article in Trends in Ecology and Evolution published last July, Scerri and his colleagues claimed that Homo sapiens had a Pan-African origin and that our species did not come from a unique ancestral population. "In our model, human ancestors were already scattered throughout Africa," she explained. "Different populations have been in contact with each other at different times and in different places. This dynamic of mixing and separation eventually led to the emergence of the behavioral and biological characteristics of contemporary human populations. The conclusions of Sahnouni and his colleagues go in this direction, although they are rather approximate, because they precede the first glimmers of the divergence of our species of approximately 1.8 million years ". In the future, Scerri hopes that scientists will make a more concerted effort to explore the so-called "less important" regions of Africa in order to get a more accurate analysis – and real– image of the evolution of the hominin in time. "The exploration of the Sahara and other areas located in the less glitzy corners of the map of human origins will likely generate significant revenue, which in no way diminishes the incredibly important and valuable discoveries of the world. Eastern and Southern Africa. "